The so-called “Family violence” bill was very controversial last year in Armenia, and only after a wave of complaints from citizens and experts, the bill was renamed as “The prevention of violence in families, the protection of people subjected to violence in families, and the restoration of peace in families”. Certain articles in the bill were edited, but this did not eliminate public concern about this proposed legislation. According to this new law, an advisory council to the Prime Minister would be established. The new council would be included in the list of public organizations and public figures which have already proved themselves to be ardent advocates of LGBTQ propaganda. Moreover, the proposed law is supported by Soros Fund Management, which clearly indicates the interest of the British Embassy and a several other countries and organizations. A separate issue is the direct attempt to integrate sexual education into the public school curriculum. The Soros Fund has allocated grants specifically for this purpose. For example, consider Lara Aharonyan. She was born in Beirut in 1972, lived for a long time in Canada, graduated from the University of Montreal, and later moved to permanent residence in Armenia. She is the head of the Women’s Resource Center and is a member of the Board of Trustees of the Civil Contract Foundation. In 2017, her organization received a grant of $55,000, in order to develop school materials for sexual education, and for educating illiterate parents in the field of sexual education. To make the reader understand the essence of these “educational programs” more clearly, we placed below some screenshots taken from the relevant site, which after a wave of complaints were edited and partially changed. However, despite the negative public response and a small processing, homosexual propaganda still remains on the site. They are portraying homosexual behavior as “normal”. Meanwhile, the standard Classification of Diseases publication still considers homosexuality to be a mental and behavioral disorder. Mrs. Aharonian does not hide her attitude to this issue. 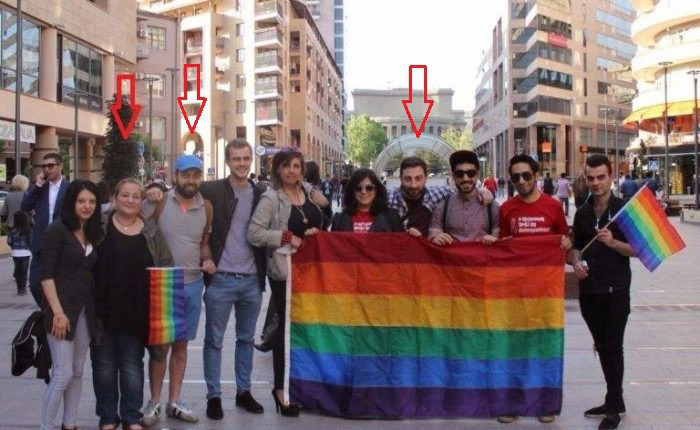 Below are photos of Lara Aharonyan with LGBTQ activists. 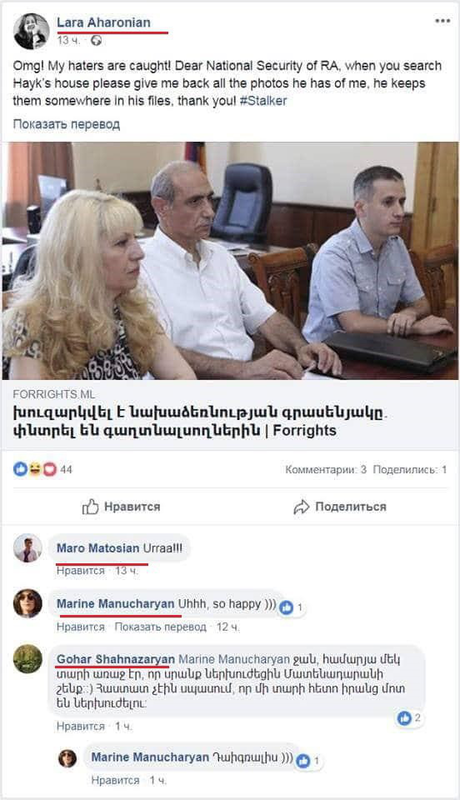 In addition, her colleague Maro Matosyan, who is also a member of the Board of Trustees of the Civil Contract Foundation, took part in the protection of the LGBTQ community. Below are photos of three figures who are members of the Board of Trustees: Maro Matosyan, Edgar Manukyan, and Arat Shirinyan. Also there is a link to information about Lara Aharonian, which refers to her activities in the field of LGBTQ community protection. Thus, these two persons are also active supporters of the newly proposed “Prevention of Violence in Families” bill. It should also be noted that many psychologists, lawyers, and teachers have expressed their concern and distrust of the proposed law. The people who support the new bill have been receiving funding specifically for the purpose of promoting the new legislation. This funding has led to accusations of corruption. Information about the grants is included below. It is worth noting a number of people who work for the Armenian branch of the Soros Foundation. Ruben Babayan has been a member of the foundation’s Board of Directors since 2016, and Zara Hovhannisyan has been the coordinator for the coalition Against the Abuse of Women since 2018. David Khachatryan is the Chairman of the Board of Directors of the Soros Foundation in Yerevan. He is also a brother of Sasun Khachatryan, the head of the RA Special Investigation Service. In recent times, some of the above-mentioned people have rejoiced when searches were made in the offices of those who oppose the new law, and in the offices of those who oppose LGBTQ propaganda. Below is a screenshot of a sample Facebook post by Lara Aharonyan. 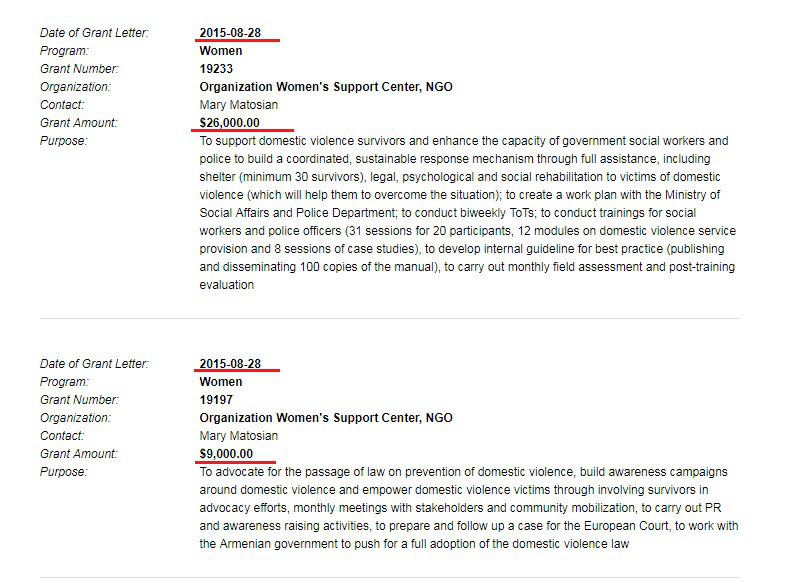 Gayane Abrahamyan is also a member of the council, and she regularly receives grants from the Soros Foundation. She is not the only grantee from the electoral list. 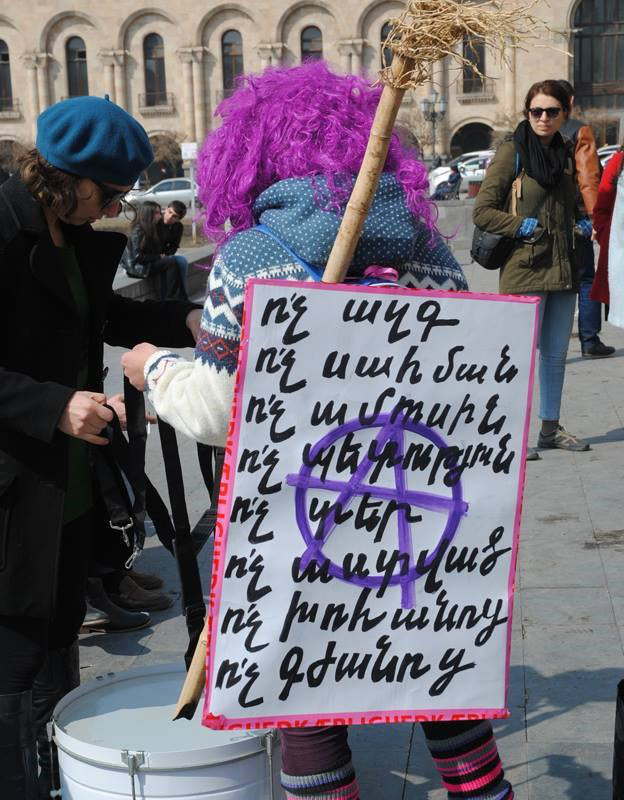 For example, in this list you can see Grigor Yeritsyan of the Armenian Progressive Youth. This public organization actively uses the Soros Fund and is an active defender of LGBTQ causes. Many strange events have recently occurred. For example, in one of the local children’s camps, young children were forced to wear women’s clothes. There were many complaints in response to this story, but the matter was hushed up by the Minister of Education, who said that it was just a “usual children’s event”. The Minister also made some controversial statements, urging students to protest against the school leadership, thus preparing the ground for students to be able to sue their parents in the future. Interestingly, a number of people who have been Deputy Ministers of Education and Science, have also been grant recipients of the Soros Foundation. The communiqué signed jointly by the RA Minister of Education and Science and the US Peace Corps is another concern, given the fact that members of the Peace Corps are ardent supporters of promoting LGBTQ issues around the world. The main purpose for this article is to raise awareness. So far, there needs to be increased public concern about the events mentioned above. It is important for people to understand the dangers of this newly proposed law. Hey Buddy!, I found this information for you: "George Soros Grant Money Assaulting Traditional Family Values in Armenia". Here is the website link: https://russophile.org/george-soros-grant-money-assaulting-traditional-family-values-in-armenia/. Thank you.